Reliable and space-saving networking in the control cabinet with only 32.5 mm installation depth. 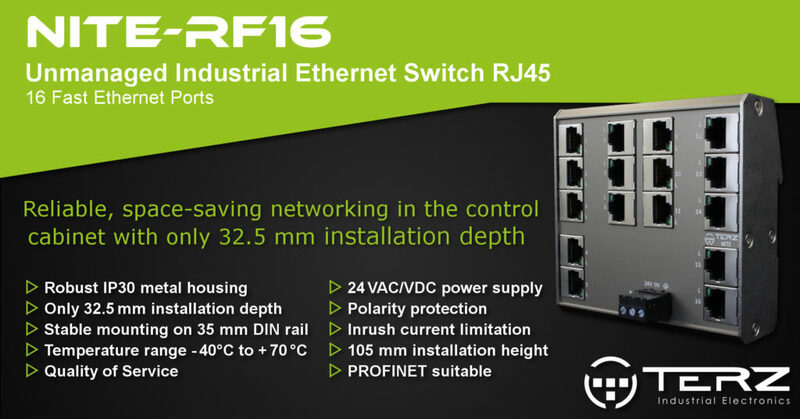 The new extremely flat TERZ NITE-RF16 unmanaged Industrial Ethernet Switch offers 16 Fast Ethernet RJ45 ports within the smallest space. Thanks to the optimized installation depth of only 32.5 mm and installation height of 105 mm, the compact switch is excellently suited for integration in electronic systems and for DIN rail mounting in optimized control cabinets. The 24 VAC/VDC power supply with polarity reversal protection and inrush current limitation, as well as the extended temperature range of -40°C to +70°C ensure reliable operation in industrial applications. The installation of the unmanaged Plug&Play switch is done quickly and easily, thanks to the arrangement of all data and power connections on the front of the device and by supporting Autonegotiation and Auto MDI-X. Crucial industrial protocols such as PROFINET are preferably forwarded by priority-controlled packet forwarding (Quality of Service). With two different frame forwarding/blocking variants (LLDP/PTCP), all applications are optimally supported. Due to the small design, the switch can also be installed directly in access control gates and ticket vending machines for example, where the available space for the electronics is limited.